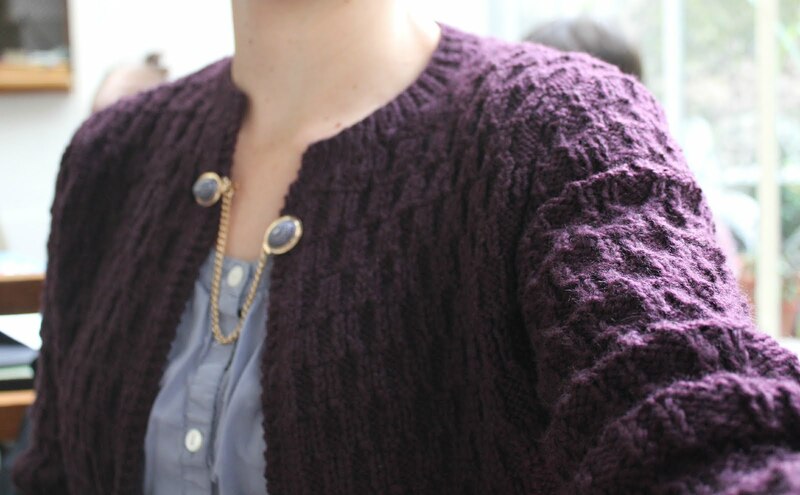 I finished my Renaissance Basket Stitch cardigan a few days ago. Today we had our TricoThé at a local salon de thé, so I asked one of my fellow tricoteuses to take a few photos of me and my cardigan. I'm very happy with the result. It's a nice, basic cardigan, but not too basic. And the yarn is pretty soft and scrumptious; it does pill a lot though. I used Kinna by Cheval Blanc. The salon de thé where we meet up is very cute and has a garden in back. It's a little too cold to sit outside, but we were right next to the window so the light was beautiful. I love the colors on the table! Oh, my friend!! The texture is lovely, and the color is marvelous on you. I love the sweater chain especially. What a wonderful event! Beautiful! It must be very difficult to make...and I really like the colour! WOW! Donna, you made a lovely work. I love the way you wear the cardigan with that accesory, gorgeous! And your friend´s scarf is so niceeee, it looks soft and warm. It has to be interesting to meet to take te and to knit. I love your cardigan, its gorgeous! How pretty! This looks great on you!